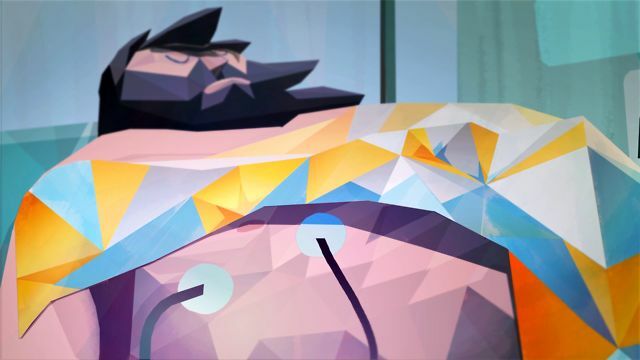 Struggle for life told in beautiful geometric animation from EMCA students. It’s not often that a single frame of an animation can win you over. But, Oben did just that. I could pause this short at almost any point and easily become lost in the lines, details and style of that single frame. This film is so engrossing to watch that it doesn’t need wild character arcs or snappy dialogue to tell its story. Oben was created by Thierno Bah, Noé Giuliani, Pierre Ledain, and David Martins da Silva as their graduation film for France’s Ecole des Métiers du Cinéma d’Animation. This is the second film that SOTW has showcased from this school; Delphine Dussoubs’ Little Monkey is the other. From their published sketches, you can see that even in the initial drawings, there is a meticulous focus on pattern and style. For example, they create our round shining sun not from a circle, but from triangles — triangles! It’s not 3D (I think), but it feels very much influenced by the low-poly aesthetic in other stellar animations like Pivot and Between Bears. Of course, maybe it’s easy to not notice these atypical angles, shapes, and colors when this animation uses such clever and stylized edits to transition between scenes. Climbing ropes seamlessly segue into medical electrodes or cliffs become breathing pumps. We are bounced from a medical table to a ferocious storm on a mountain as the reality and metaphor of the dire situation blend into one. In fact, the transitions are more like beautiful shifts than traditional edits which makes this film feel, somehow, more dimensional. Overall, it’s clear that the style of these animators is limitless and I look forward to seeing more of their work.